Unfilmable. It was an adjective often invoked in fan discussions of David Mitchell’s Booker Prize-nominated 2004 novel Cloud Atlas – a delightful, time- and genre-spanning puzzle box that uses a deceptively simple structure to tell six interlocking stories spanning four centuries. Now it’s 2012, and Wachowski brothers Lana and Andy (THE MATRIX) along with Tom Tykwer (RUN LOLA RUN) just filmed that puppy. The result, also titled CLOUD ATLAS, is a strange, richly imagined mosaic comprised of equal parts filmmaking expertise, well-intentioned soapbox philosophizing, and consummate self-absorption. I wholeheartedly recommend this film to anyone who enjoys movies, but there’s a good chance that you’ll absolutely hate it. I know. A ringing endorsement. If you don’t know anything about the film, it’s made up of six stories, all starring some permutation of the same cast – Tom Hanks, Halle Berry, Jim Broadbent, Hugo Weaving, Jim Sturgess and Doona Bae – whose characters are reborn and reconfigured across the centuries, playing out variations of their triumphs and sins in a range of scenarios that vary in cinematic scope from a slapstick adventure though a modern nursing home to a clone-centered labor rebellion in a future of totalitarian capitalism. Whereas Mitchell’s novel is something of a riddle, presenting six disparate stories and allowing the reader to coax out the underlying connective tissue, thematic sinews and character meat, Tykwer and the Wachowskis two (who co-wrote the screenplay and split directing duties) have chosen to brightly highlight (and bold and italicize and then shoot fireworks at) the larger ideas – truth and greed and love and betrayal and all that good stuff. The complexity of the film, then, doesn’t come from any larger, groping reflections on the meaning of a particular visual metaphor or the larger artistic intentions of the work, but instead from the simple fact that each story is split into dozens of two to five minute scenes between which the audience must flitter and jump for nearly three hours. Still, if you can forgive some intermittent visual bombast, and the perpetual heavy-handed voiceovers that twine platitudes and naval-gazing emotional masturbation into the sickly-sweet rope that bind the stories, CLOUD ATLAS boasts a wealth of rewarding material. For as lengthy and thematically overblown as it is, this is an impressively controlled and surprisingly coherent film. Like the novel, the film deals in a variety of genres. And, at its best, it exploits the dialects of each of these – from period romance to sci-fi to comedy – to stress that, for as much as the piece toils over all the sublime aching defeats and passions of the human experience, it’s equally interested in the human obsession with structuring our shared experiences into consumable narratives that, while wildly different in their plots and setting, are all forged in the crucible of the human heart, and, as such, find even the most unrelatable characters banging their heads against the same messy, life-y stuff. Bearing that in mind, I almost wish some of the stories descended a bit farther into self-conscious genre wetwork – the 1970s bit, for example, does a great job with its period props and costumes, but casts too wide of a stylistic net, referencing the era rather than inhabiting it. Sure, you get CHINA SYNDROME-style nuclear paranoia plus a paper chase and a not-nearly-ballsy-enough niblet of Blaxploitation, but with the swelling symphonic soundtrack and all-too-generic chase sequences, it never really crystallizes into the full-on bit of throwback b-moviedom that it might have been. Still, After the dual disasters of RELOADED and REVOLUTIONS, not to mention their scattershot V FOR VENDETTA screenplay (confession: I totally dug SPEED RACER), it was a treat to see the Wachowskis exhibiting such (relative) restraint. To be sure the film never lets you forget that it has epic pretensions, but you can’t blame a couple C-4 enthusiasts for finding dynamite subtle. Tykwer, meanwhile, whose last book-to-film adaptation PERFUME: THE STORY OF A MURDERER tried to beat an epic out of an enjoyable bit of pulp fiction, has finally found source material to fit his cinematic aspirations. 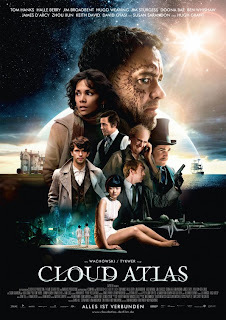 I can already hear the fanboy choir: CLOUD ATLAS is the type of film that you have to see twice to catch everything. Everything? Maybe. But Green-gilled as some will curdle at the movie’s repeated syrupy narration and nail-on-the-head editing, the forthrightness with which it sews its heart to its sleeve, and the uncharacteristic attention to detail that dresses each of its six story worlds, work well in tandem to make an enjoyable and off-center single-serving film, while still offering plenty of tantalizing details to be discovered and puzzled over by those who feel engaged enough to become repeat viewers.